This Chocolate Cake is perfect for a party! 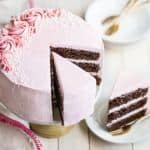 Moist chocolate cake layers, filled and frosted with a sweet and delicate raspberry Swiss meringue buttercream, for a pretty pink dessert that’s sure to delight! Isn’t this a pretty pink cake? Is it bad that I made it for my husband’s birthday? Be honest. It’s ok. I know it is. This cake has no business being at a grown man’s birthday celebration. I feel terrible about it. But what can I say? After the dude food bonanza known as Superbowl, I just really needed something frilly and flowery for Valentine’s Day. When it comes to desserts, I’ve got two top favorite categories: one is sweet/salty and the other is chocolate/fruit. Chocolate and raspberry is a gorgeous combination and it works beautifully in this towering triple-layer beauty. Besides being lovely for your Valentine, I think it would be equally fitting for a bridal or baby shower, a little girl’s birthday party, or even for Mother’s Day. The cake itself is rich and deeply chocolate-y. It’s actually just this cupcake recipe, baked in three 8-inch round cake pans. The recipe is tried and true. It is, hands-down, the most popular recipe on my site. Everyone loves it because it’s easy to make, moist, and the flavor is off the charts. When combined with a subtly sweet, light and fruity raspberry Swiss meringue buttercream, it’s just dreamy. I know the decoration looks fancy but honestly, you won’t believe how simple it really is. I will be demo-ing it this Wednesday on Fox Good Day, so if you’re in the Philly area keep an eye on the tv around 9:30 am EST. If not, I’ll be putting the clip up later that afternoon, so I’ll add a link back to this post then. Just FYI, I love this kind of piping bag for decorating with buttercream. And the tip I used here is a 1M. One tip makes both kinds of rosettes that you see here. I also added a sprinkling of these and these, to make it extra pretty. Maximum impact; minimal effort. PS- I don’t think my husband really minded all that much! This Chocolate Cake is perfect for a party! 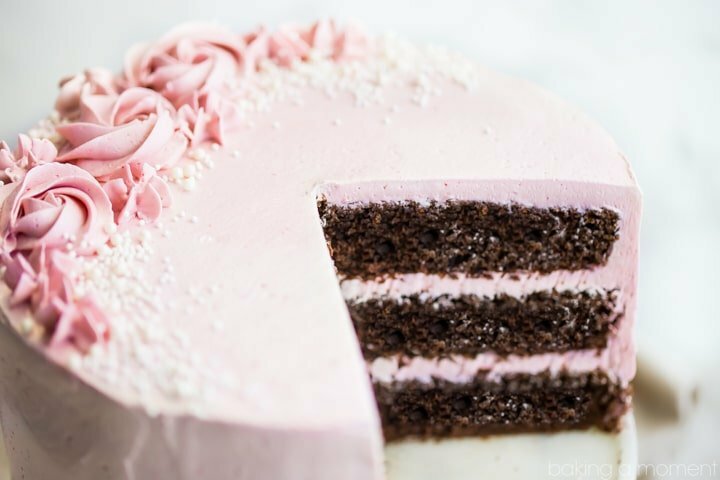 Moist chocolate cake layers, filled and frosted with a sweet and delicate raspberry Swiss meringue buttercream, for a pretty pink dessert that's sure to delight! Preheat the oven to 325 degrees F. Generously mist three 8-inch diameter cake pans with non-stick spray, and line with circles cut from parchment paper. Cut the butter into smaller pieces and add it to the dry ingredients. Mix on low speed until the mixture resembles damp sand (30 seconds to a minute). When all of the eggs are fully incorporated, add the Greek yogurt and vanilla, and beat on medium speed for about 60 to 90 seconds, to aerate the batter and strengthen the cake's structure. Divide the batter evenly between the three prepared pans, and bake for 30-40 minutes, or until a toothpick inserted in the thickest part of the cake comes out clean or with one or two moist crumbs. Cool completely, then fill and frost with raspberry buttercream. Puree the thawed berries in a food processor, then strain the mixture through a fine mesh sieve, discarding the seeds. Place the puree in a small pot and cook on medium-low heat until thickened and reduced by about half. You should have about 1/4 cup of cooked puree. Set aside to cool. Place the egg whites and sugar in a large mixing bowl set over a pot of simmering water. Cook, whisking occasionally, until the mixture is smooth, thin, and translucent, and it no longer feels gritty when rubbed between the thumb and forefinger. Remove the bowl from the heat and whisk on medium-high speed until fluffy and stiff, and no hint of warmth remains when you place your hand on the side of the bowl. Add the butter, a tablespoon at a time, whipping after each addition. If the mixture seems runny, place it in the refrigerator for 10 to 20 minutes, then re-whip. When all the butter has been added and the mixture is fluffy and spreadable, stir in the cooled raspberry puree until fully incorporated. *Be sure to check out this VERY comprehensive Swiss meringue buttercream post for a step-by-step picture tutorial PLUS all your questions answered! OMG Allie!! Totally gorgeous! I’m sure he is going to LOVE! Lucky husband! I guess that depends on how fast you work? For me it takes about 20 minutes to make the cake batter, 15 minutes for the raspberry puree, and maybe 20 or 25 for the frosting? Allie, this cake is stunning and beautiful!!!! This must mean that Mr. A likes pink! 🙂 it’s gorgeous and perfect. . this could seriously be a wedding cake. . or shower cake. . so pretty!!! Thank you Alice! After I finished putting on the finishing touches, I thought the same thing! Thanks Kellie! I know I sure could, lol! Allie, this cake is stunning and I love all the details you add to this cake. Superb! Thank you so much Linda! Sometimes the simplest decoration can really give the best impact. Hope your week is off to a good start! The cake is lovely and the layers look so moist. Only 1-1/2 cups flour??? Seems like such a small amount for 3 layers and the other amount of ingredients. Yes, I know- you’re right! But there is a lot of cocoa powder too and that really soaks up the liquid. Thank you so much for the great question and the sweet compliment Charlotte! Oh my gosh this cake is beautiful! 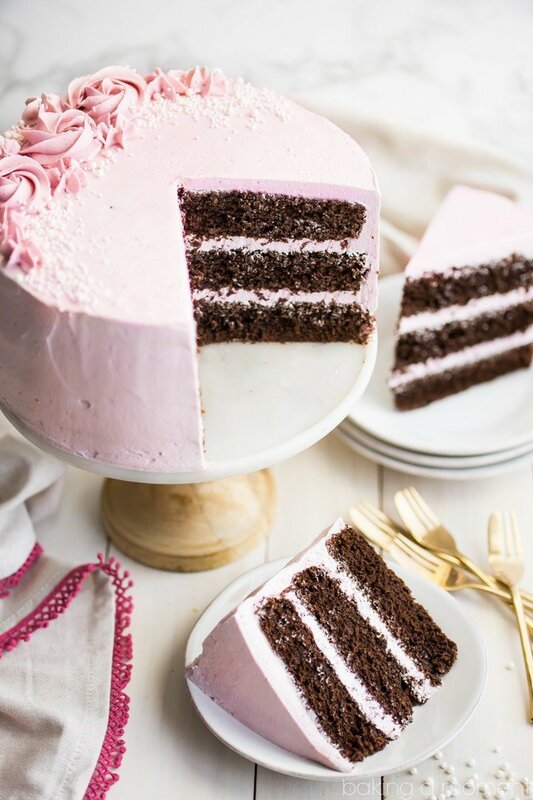 I love the contrast of the light pink frosting on the chocolate cake. So perfect for Valentine’s Day- or any day! Thank you so much Mel! I had so much fun decorating it, and it’s definitely a top favorite as far as flavors too. So happy you like it! Thank you so much Lucy! I just needed a little femininity in my life haha! Wow Allie, this cake is truly gorgeous!! 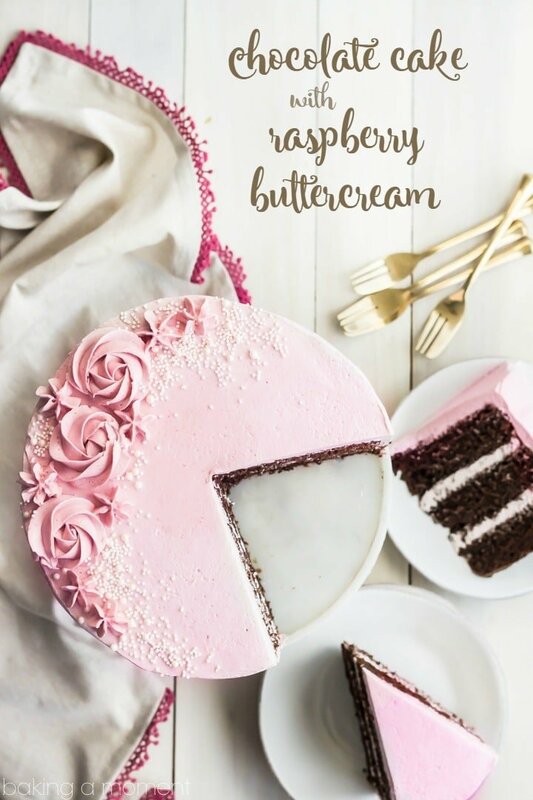 I love the subtle, delicate pink color of the frosting, and I’m looking forward to seeing the video of how you decorated it. Thank you so much CakePants! 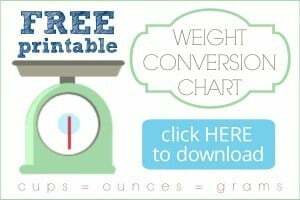 I can’t wait to share it- you won’t believe how simple it really is! Beautiful cake for any occasion! I love your cake stand! Just wondered if you can make this cake in a 13 x 9 pan. Don’t have 3 8″ cake pans. Thank you! Stunning as always, Allie! Your cake decorating skills are on point. I could really learn from you!! This looks incredible! Love it! This cake is absolutely stunning my dear. I would want it all for myself! Next time I see you I’ll be sure to bring you one 😉 Thanks boo! This cake may be on the girlie side, but your husband had to love it, didn’t he?? It’s so beautiful, Allie, and I love the sound of that buttercream! He didn’t mind too much, lol! I mean it’s cake, right? How mad can you be. Thank you so much Marcie! This cake is perfection Allie and you have frosted it beautifully! Pinned! Awesome – you are truly talented. Oh, yay! I hope you have fun making it and all the guests enjoy. And congrats to your friend! This is ethereal!! So beautiful and tender. The swirls are amazing! Love love it! Thank you so much! I love your description. You are the sweetest! This cake is SO gorgeous, Allie! Such a pretty color and I’m sure Mr. Allie still adored it 🙂 I love all the little details! Thank you sweetie! He seemed pretty pleased with it even though it was extremely girly and feminine, lol! You can’t beat chocolate and raspberry, especially in cake form! And I really like your piping details – so pretty! My pleasure, Marie! I hope you have a chance to make it sometime. I absolutely loved it! Such a pretty cake but, even better one of my favorite combos. Can’t wait to try! Thanks for the recipe. Pinned for later. Allie this cake is just picture perfect!! And chocolate + raspberry is just the absolute best! What a gorgeous cake! Love the way you decorated it, simple but elegant 🙂 The rose buttercream sounds delicious too! Thanks June! It had been too long since I’d made a layer cake. I’m so glad you like this one! Thank you so much Megan! I’m so happy you like it. Chocolate + fruit is the best! This cake is absolutely gorgeous! And raspberry and chocolate is definitely one of my favorite combinations! Thank you so much Sabrina! It’ definitely a favorite for me too. Hope you’re having a great weekend sweetie! I just made a layer cake today too, Allie, so I’m really in a cake-y sort of mood. Mine was more of the rustic variety (!! ), though. This is absolutely incredible. It’s a work of art – I just love the beautiful piped roses. What a lucky husband you have. I’m sure he didn’t mind about the romantic pink theme. It is Valentine’s day tomorrow, after all! Good point Helen! Any kind of cake is a good thing, in my opinion! Thank you so much for the sweet compliments and I hope you’re enjoying your cake right now too! Oh yes! Those fruit and chocolate combos are the best! I’m so happy you like this cake. Thank you so much for popping by and for the sweet comment! I should not be looking at this cake at 10:30 at night… I’m not craving cake like crazy! This is absolutely gorgeous Allie! I made this cake today, and other then the fact that I didn’t let the sugar completely dissolve for the frosting the cake was absolutely INCREDIBLE. I plan on using this recipe for one of the cakes at my wedding. Thanks so much for sharing. I’m so thrilled that you love it, Maleia! It’s definitely a favorite of mine too. Thanks so much for the awesome feedback. Congratulations and all the best to you and your beau! I have not tested the recipe as a 9-inch cake, so I can’t say for certain, but I do think it should work as is. Just divide the batter equally between the two pans and keep an eye on it as it bakes. When it springs back after you press it in the middle, stick a toothpick in it. If the toothpick comes out clean or with one or two moist crumbs clinging to it, you can take it out of the oven. Hello, I was wondering what nozzle you used for the flowers??? Hey Lianne! All the products are listed and linked in the second to last paragraph of the post. Hope that helps! I’m working with a time budget, can I go ahead and make the raspberry puree in advance of making the rest of the icing? Would it need to be in the fridge, then come to room temp before adding to the icing? Sorry I didn’t get to your other question sooner Ruth! But it sounds like you figured out out on your own. Definitely make the raspberry puree ahead if you can! If it’s too hot when you add it to the buttercream, it will melt it. I hope that helps! Made this cake today for a birthday and although very pretty and the frosting was good, I did not like the cake at all. The batter was difficult to work with because it was so thick. Really almost no liquid. It looked like brownie batter and the cake was heavy and dense. Like a brownie. Will not remake this again. I’m sorry to hear you weren’t happy with it, Cheryl. I actually love the thicker batter, it makes portioning it out into cake or cupcake pans really easy and drip-free. However when I make it it’s usually really light and fluffy in texture. It should not be like a brownie at all. Just for the benefit of others who may be reading your comment: be sure not to overmix this batter. Beat in the eggs just until incorporated, and once the yogurt and vanilla goes in, it should only be mixed for a minute or so on medium-low speed. If you want to see how the batter looks before baking, check out this post: https://bakingamoment.com/simply-perfect-chocolate-cupcakes/. If I made this as cupcakes, do you have any idea how many it would make? Hey Star! I actually included a link to the cupcakes recipe within the post. Here it is again, in case you missed it: https://bakingamoment.com/simply-perfect-chocolate-cupcakes/. All the info is on that page, but to answer your question it makes 32. Thank you Allie for your response. Chocolate cream sounds amazing! You have a very good website. Can I make this with fresh raspberries? Hey Ina! You sure can- you’ll just want to be sure and cook them down so they’re pretty thick. If you have about 1/4 cup of cooked puree, you should be good. Thanks for reading; hope you enjoy! Could carob powder be used in this recipe instead of cocoa powder? Did your raspberries have added sugar? Thanks. Trying the recipe tomorrow. When you say set the mixing bowl over a pot of water, you are just using a glass mixing bowl and setting it on the pot with a gap between the bottom of the bowl and the water? I have never tried that before and want to make sure I do it correctly. My daughter is turning 5 and requested this cake based on the picture she saw on Pinterest. I love making different and unique cakes each year for my kids, so I am excited to try this for her. I love doing that too Jessica! And yes you have exactly the right idea. I just use my mixing bowl from my stand mixer and place it above the simmering water just as you said. My mixing bowl is actually metal, but it should work with glass too. Just be aware- because the glass is so much thicker it may take a little longer to heat and a little longer as well to cool. Cooling is really important so please don’t rush that step! If you do the butter will get too melty and you’ll have runny frosting. You can bring it back by placing it in the fridge and re-whipping, but I just want to make sure everything goes smoothly for you and your daughter. Please tell her I said happy birthday! And I hope she enjoys the cake! Thank you! I think she will. I love a new cake recipe. I am more worried about the decoration on the top. I am great at making things that taste delicious, but usually don’t care much about making them “pretty.” However, I know half the reason she picked this one was for the beautiful flowers on top! Wish me luck. Her birthday is in 2 weeks, so I will let you know how it turned out. I saw this on Pinterest and I had to come tell you this is one of the prettiest cakes I have seen. I just love it!!! Now if only my husband could make this for me on my birthday, lol! Aw, thank you so much Malinda! Thank you thank you for taking the fear out of Swiss Buttercream for me! I used cherries in the frosting and it was delish! I had a learning curve making it on an extremely hot day but I’ll take note for next time. The cake was a hit as well! I will definitely make this again! But I do have a question, if I don’t use any fruit reduction do I just add some vanilla to the frosting? Hey Kim! Oh my goodness it’s my pleasure! I love Swiss buttercream and I think it’s so worth that little bit of extra effort. I’m so glad you liked the cake and yes! Just leave out the fruit and add a little vanilla, or chocolate, or espresso… The options are limitless! Hi Allie, I fell in love with this cake, I’ve just made a test run today ready for the real thing at the weekend. It went ok but my icing was definitely not as smooth as your finished look, it seemed quite runny, I kept putting it in the fridge but it didn’t get much firmer?? Also I have realised I will have to make 3 cakes in total to cater for everyone, how far in advance can I make the cakes? How is best to store them? & once I’ve iced them are they best kept fridges until serving?? No worries at all Fleur! You can definitely make and frost the cakes in advance. And yes, they’re best kept in the fridge. I’m not really sure why your frosting came out runny though..? Was the meringue fluffy and stiff before the butter went in? Had it cooled completely? How long did you refrigerate it? Was the raspberry puree thick and jammy before you folded it in? Thank you so much, it will definitely help if I can get them prepared a bit earlier. I think probably it was a combination of all those things, I think the meringue wasn’t cool enough & the butter too warm? I did fridge it for over an hour but maybe I was fighting a losing battle by then?! My coulis probably could have been thicker….that’s why I did a test run!! I will try to remember to take my time next time!! Some recipes recommend using half butter/half shortening to make a firmer, more temperature stable frosting, would you recommend this? It’s all a learning process, right? I bet the next time it will come out perfect. I have never really tried adding shortening to Swiss buttercream but I imagine it would probably work (?) Personally I prefer the taste of butter but I can totally understand why you’d want that extra little bit of insurance, especially with the weather as hot as it’s been. Good luck! Hi there! Could you use a store bought raspberry jam or preserve instead of the puree for the buttercream? Hey Jen! I absolutely think that would work and I bet it’s a great shortcut. Good luck and thanks for the great question! This is such a pretty cake! I’ve been searching for a chocolate cake recipe that uses butter instead of vegetable oil and can’t wait to try it. Just one question: would I be able to use sour cream instead of Greek yoghurt? I actually have a tub of sour cream in my fridge that I need to use up. Thank you! Hey Stephanie! I have made this recipe with sour cream many times and it works great. Thanks so much for the sweet compliments and the great question. Hope you enjoy! Oh my goodness of course! That’s what I’m here for 🙂 I hope you love the cake as much as I did! I totally did! (And everyone else who ate a slice!) I ended up making it with a combination of Greek yoghurt AND sour cream (didn’t have enough Greek yoghurt!) and the batter was so creamy smooth. I LOVE THIS CAKE. I have tried many chocolate cakes in the last year but there was always something lacking (and I really wanted a cake with butter, not oil). This is THE ONE for me, it was just right in terms of moistness and had a good chocolate flavour. I also didn’t have to worry about remembering to take the butter out beforehand. THANK YOU for not just posting this recipe, but for your useful instructions (including speed and how many seconds)—I followed them to a T. I baked it in a 9 x 13 inch for 30 minutes and used the leftover sour cream to make a sour cream-choc ganache to top it with, so yummy. I will have to try your raspberry buttercream the next time, and there WILL be a next time. One last question though: Have you tried baking this with dark cocoa powder? Will other ingredients need to be adjusted if it is used? Hey Stephii! I am so sorry this comment got buried while I was on vacation last week and I’m just finding it now! I’m absolutely thrilled that you liked this recipe. As for your question- I have tried subbing some of the cocoa out for dark and I’ve been happy with the result. But there was another reader who completely replaced all of the regular cocoa with dark and she thought it tasted a little soapy. So I’d say maybe just do half and half, that seems to work ok! Good luck and I hope that helps! I haven’t had this in years. such a delicious cake. thanks for sharing. Hi Allie! I was just wondering how you get your cakes to cut perfectly for pictures. Do you refrigerate them before cutting? I’m just imagining cutting a cake and having the frosting blend into the cake after being cut. And the pieces squishing down on the sides. Yours look perfect! Just curious, thanks! Hey Tara! Thanks for the great question! This cake right here, I actually wasn’t all that happy with the way it cut, to be honest. The frosting didn’t squish out the sides at all (I don’t usually have that problem), but the soft cake kind of crumbled into the frosting when I sliced it. I think it works much better when I refrigerate the cake for a while. I did that with this one (which is actually the same cake recipe, just with a different frosting) and I was much happier with the way it came out. I left it in the fridge for a few hours and then let sit on the counter for about 30 minutes before slicing. The frosting can’t be too cold or else it will crack. I hope that helps! This looks amazing. I want to make this the night before it is served. Would this keep overnight on the counter? Thanks Victoria! Yes it absolutely will. In fact I like it better when it’s had a chance to rest a bit, and meld. I hope you enjoy! I honestly can’t remember if this one needed levelling or not, but I use this chocolate cake often and if it ever comes out domed I do slice off the top a bit. Usually it bakes up pretty flat because of the lower oven temp, but if it needs levelling or torting I take a serrated bread knife to it and it works fine, especially if I’ve chilled it in the fridge first. Hope that helps Paula! I have no idea what is cup cake flour. Do you have a brand you recommend or a store I can but it at. Also can i just use regular all purpose flour and not put the cup cake flour? Hi Kaylee! I like cake flour for this particular recipe- it produces a lighter texture and a finer crumb. I typically buy Swan’s Down or Softasilk. It’s usually in the same aisle as regular all-purpose flour. Just look for “cake flour,” (it’s not “cup cake flour”). You want to use 1/2 cup of cake flour. Hope that helps! Do you think I could use Vanilla Yougert? It’s what I have on hand. Or, is the yougert in sub of oil? In which case, do you think Cola would be a good flavour in this recipe exactly as is? Hey Amanda! The yogurt is not in place of oil- there’s already butter in the recipe so no need for any additional fat. And I don’t think I’d recommend using vanilla yogurt either, there’s probably a lot of added sugar in that. If you can’t get your hands on plain Greek yogurt, try subbing regular plain, unsweetened yogurt, sour cream, or buttermilk. You can make your own buttermilk by adding a couple teaspoons of lemon juice or white vinegar to a cup of regular milk. Hope that helps! Can the cake be iced the day before. Made this cake for my mom’s birthday – chocolate and raspberry is one of her favorite combos! The cake turned out great, though I did have a little trouble with the icing – I don’t have a cloth strainer so I was trying to get the puree through a mesh one, and it just wasn’t having it! I think my problem was that my raspberries were still a teensy bit frozen. And then I made the mistake of trying to whisk in the puree instead of folding it in gently, which took a ton of the air out of the gorgeous icing. Still, after a while of whipping it got back to normal. The icing was SO SMOOTH and creamy! I’ve never tried icing cooked that way before and it was SO worth the extra effort! I’m not so great at cake decorating, I just iced it and put some fresh raspberries on it, it looked great! I bet my mom will be requesting this one again next year! Aw, I’m so thrilled that you were happy with it Debra! Thanks so much for the awesome comment and the great feedback. Happy birthday to the boys! Made a ‘try-out’-cake yesterday and it came out sooooo nice. Gonna do this for my daughters birthday next week. Think I’m going to make two versions. One like the cake above and one with chocolate-frosting. Thank you for sharing the recipe❤️? Oh that’s so great to hear! Happy birthday to your daughter and I hope she loves the cakes! Heyy ? This cake looks amazing!!!! But I have a question I tried such a frosting last weekend and it was really disgusting I don’t know what I did wrong… It was perfect at the beginning but then I put it out to cool down and when I mixed it again it was really flaky and crumbling and not smooth do you know what I did wrong eventually the egg whites and the sugar were to hot when I mixed it with the butter… I have no idea what went wrong can you help me because I really want to try this cake because tomorrow is my birthday…. Hey Zora! I’m a little confused- did you use this recipe or was it from somewhere else? Hi Allie!! I am such an amateur baker, but I love trying new recipes. My husband picked your recipe out just from looking at the picture and asked me to bake it for his birthday. I didn’t dissolve the sugar enough and it was still runny after doing the butter, so I put it in the fridge like you said and it helped a lot. I actually had to leave it in the fridge for an hour because we had a game to go to, but it turned out well. And SOO YUMMY!! I am in love. I also noticed that my cake became brownie like and sank a little in the middle, but hey, I am easy to please, and it still tastes good. But for next time, how can I avoid the sinkage? Thank you again for your recipe! Hey Suzy! So happy you and your husband enjoyed for the most part! I think that sinkage is probably a result of either a) opening the oven before the cake’s structure has fully solidified (perhaps to test for doneness?) or b) slightly underbaking. So maybe next time just give it plenty of time in the oven 😉 Hope that’s helpful! How long does this cake last if I want it for a wedding will it last a couple of days? It should last at least that long Amber, and it freezes very well too! Really beautiful! Would you be able to tell me about how tall a cake these 3 layers will make? I love tall cakes! Thank you! Your cake is absolutely stunning. And so delicious. I made it for my sons birthday, it didn’t look as good, but everybody loved it, my husband even requested it for his b-day. Thank you for the recipe! This cake is AMAZING!!!! Well-worth the effort. Made this for Boss’s Day today. My, oh my…she and all my co-workers were in heaven 😀. Thanks so much for a fantastically delicious recipe, Allie! My pleasure Liz! So happy you and your co-workers enjoyed. And I hope you get a big raise for being so awesome on Boss’s Day! Hi Angela! Sorry you had some trouble. How long did you refrigerate the buttercream, and did you continue to whip it once it had been chilled? Hi! This cake looks delicious! My daughter wants a chocolate and strawberry cake for her birthday. Do you think I can replace the raspberries of your recipe by strawberries? Hi Anne Sophie! I’m so happy you like this cake. I think that would work just fine! Good luck and happy birthday to your daughter! Thank you Allie! I’ll let you know how it turned out! This is the exact flavor of cake I was looking for to serve at my friends baby shower. Would a chocolate fondant work over this frosting? I’ve tried many of your recipes and their all winners!! That’s awesome! How perfect. This would work very well coated in fondant! When I worked in bakeries we always used a Swiss or Italian buttercream under the fondant. Have fun and congrats to your friend! Have you ever converted this to Gluten free flour? I haven’t, but I have gotten comments from other readers who have done so and had success. If it’s a flour blend that’s meant to substitute 1:1 with regular flour, then it should work! So happy it worked well for you Kelly! Thanks so much for the positive feedback! Just made this for the third time, but this time I used frozen black cherries instead of raspberries and it was awesome! Added a teaspoon of almond extract to the cake (instead of 1 of the tsp of vanilla) and icing plus a pinch of salt. Also, I finally invested in 3 8-inch pans instead of the two, different brand 9 inch pans and am so happy with the results. Thank you for your recipes and insight on technique! Everyone thinks I am such a pro now, haha. That’s so great to hear Kim! I love a smaller, taller cake and I think those pans will be a great investment for you. The chocolate/cherry/almond combo sounds amazing!